In some areas, like science or Forensics laboratories, it is of great importance to keep the rooms spotlessly clean. This can be for multiple reasons depending on the company, for instance there could be a risk of evidence in a trial being contaminated with dirt from someone's shoes. 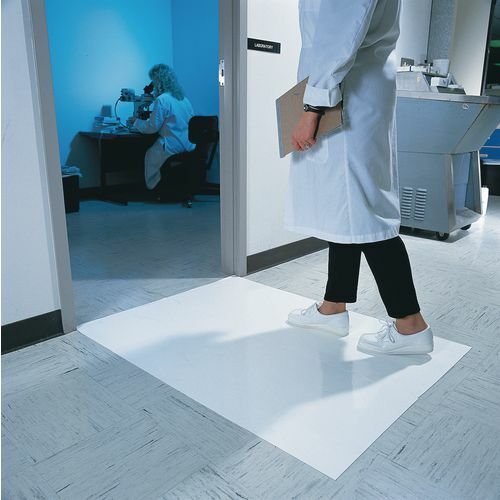 Our Economy clean room mats are ideal for use on low pile carpet, tiles or concrete and best placed directly outside the room you need to prevent contaminants being brought in. The tacky surface on the mats effectively pulls and traps dirt and dust off shoe soles, preventing contaminants from entering the clean area. They are available in two widths; 910mm or 1140 and are sold in packs of four pads; each pad contains 30 removable mats. Our economy clean rooms mats are efficient products which remove dirt and dust from the soles of shoes before someone enters a clean area or room; they are available with a 12 month guarantee and FREE UK Delivery.